Ramayana is an epic as we all know. We all know it’s story. Rama after marrying Sita, gets exiled for 14 years. Lakshmana, his brother becomes his accomplice in the exile. Ravana kidnaps sita. Rama, with the help of Hanumana, rescues her after a long battle of wits and courage. In Simple words, this is the story we all know. So what’s new the author shubha Vilas has to offer? Let’s find out! I haven’t read its prequel Ramayana- the rise of the sun prince. But, with an intrigue of finding out whats new in this book, I began reading it. The story commences from Dashratha’s nightmare, which wakes him up and leads him to ponder upon his worries and who shall he crown as the next prince. It is then followed by various interesting sequences which makes Rama get exiled. The mixed feeling Dashratha goes through when the crowd of the meeting cheers his decision of crowning Rama seemed so practical. Lakshmana who seems quite impatient and action oriented was easy to get connected to. Rama seems courageous and wise. The characters are described amazingly in the book, so much so that you can actually get connected to them and feel their emotions! There’s a reason for it being called an epic, it has hidden meanings, morals, and many virtuous dimensions which we aren’t aware of. And this book, completely explores that! 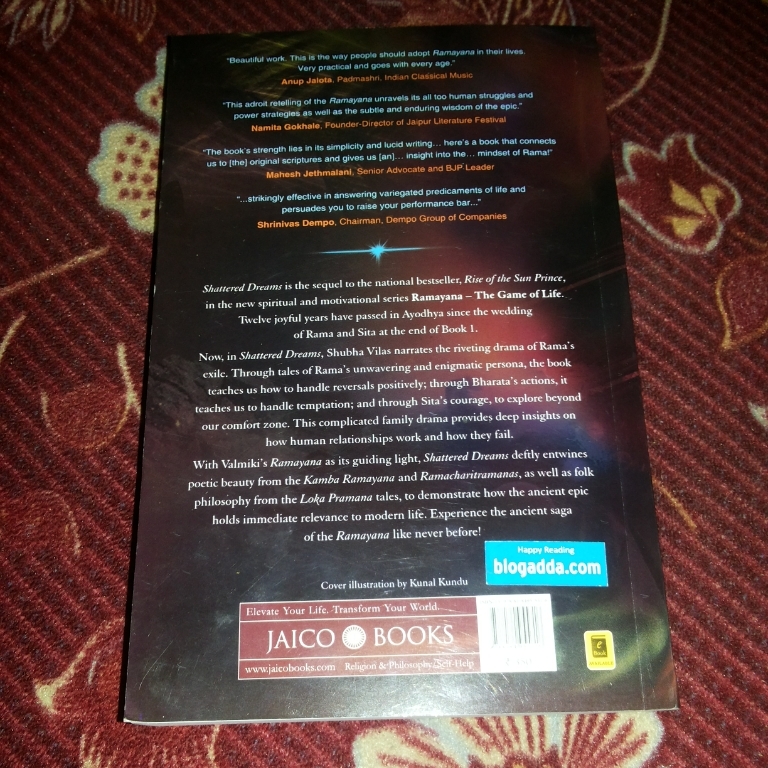 These are some of the excerpts from the synopsis on the back cover, which describe the book in best possible way! 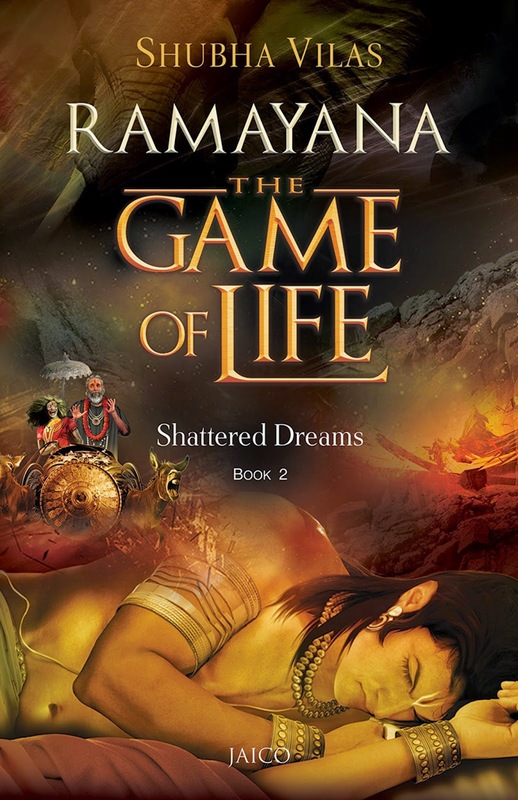 In Shattered Dreams, Shubha Vilas narrates the riveting drama of Rama’s exile. Through the tales of Rama’s unwavering and enigmatic persona, the book teaches us how to handle reversals positively, through Bharata’s actions, it teaches us to handle temptations, and through sita’s courage to explore beyond our comfort zones. This family drama provides deep insights on how human relations work and how they fail. The most engaging and compelling aspect of this book is the foot notes. Its filled with the moral values principles which we should learn from every incident of Ramayana. These principles are derived from every major decision, feelings and thoughts the characters go through. Shubha Vilas has written it in such a way that you get answers for many questions on life which might have been buried deep inside you. I loved this book for this feature! Hope I indulge my life in these principles. ” Self glory decreases one’s merits, which is why wise people consider self glory as suicidal. ” and there are many many more!! The book also has some great renditions on modern management mantras such as- Respect management, decision management, Reputation management, Team management and character management. There are many moral ideas which make you feel like thanking the author for including in this book. This only shows to prove how genius the author is and with so much genuineness he has written! Other thing which I liked is the simple language. People of any age group can read it. Its not that its way too easy like we are used to read in Durjoy Dutta’s books and my blog. However, there are some words which would require dictionary, but its not even as difficult to understand as J.K Rowlings’ books are! The author seems to have in-depth knowledge of Ramayana, this can be easily known because of the details and facts it provides which you might not be even aware of, example – Dashratha was called Nemi and how he defeated Sambaras with keyikei’s help. Let’s take a look at the other elements of the book. Cover Page: The cover page is is illustrated by Kunal Kundu, and as you all can see, it gives an ancient old era feel making it attractive and intriguing. Synopsis: The synopsis is quite like a puzzle, which is good. The book delivers what it promises in the synopsis. 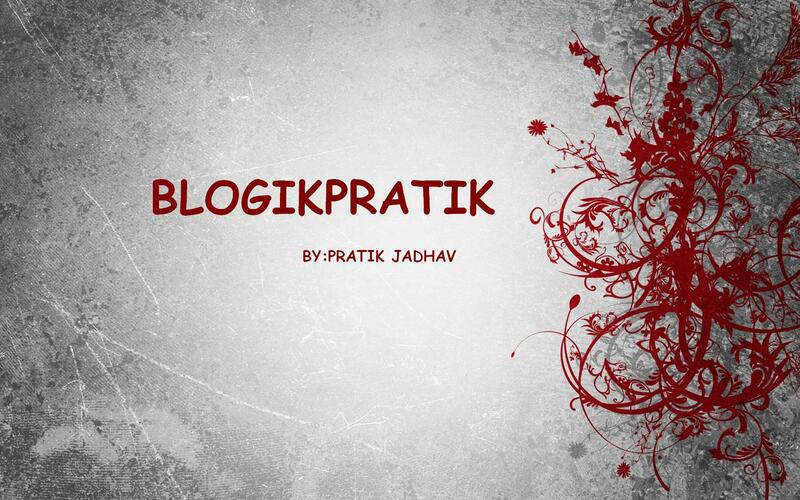 BlogikPratik verdict: 4.5 stars/ 5 stars. This book will teach you many things in life which you were puzzled about. Read it to increase your Mythological knowledge and a super entertaining ride!